At noon today, runDisney will open registration up for the 2015 Princess Half Marathon weekend. This is a fantastic running event which celebrates runners of all ages, sizes and speed at the place where "dream come true!". 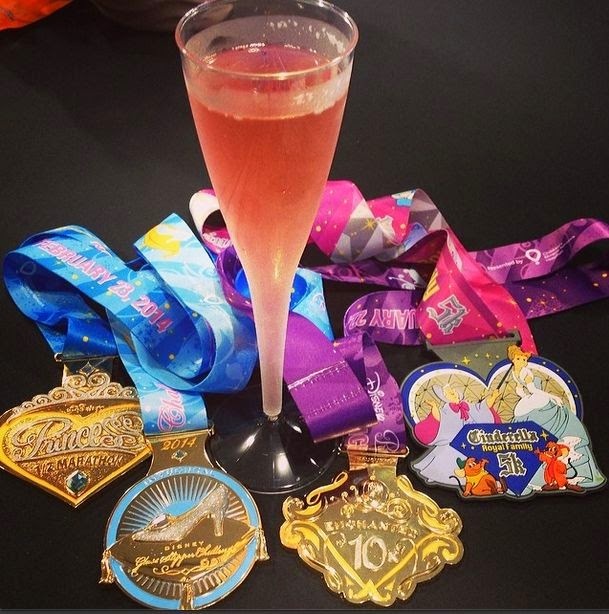 This will be the second year for the super popular Glass Slipper Challenge - 2 days of running with princesses - starting with the Disney Princess Enchanted 10K on Saturday and ending with the Disney Princess Half Marathon. All finishing participants will receive medals for both events, along with a special finishers medal to celebrate their multi-race achievement. 2014 Princess Half Marathon Weekend Medals (L-R Princess Half Marathon, Glass Slipper Challenge, Enchanted 10K and Royal Family 5K). I have heard rumors of both the Kids races and Family Fun Run 5K being Frozen themed. Again - this is a rumor but if this is true, I expect to see a lot of Olaf's, Anna's and Elsas out there. The 2012 runDisney Royal Family 5K was my very first race. If you were considering signing up for your first race, this is the one I strongly suggest. In case you were wondering, Tinker Bell Half Marathon Weekend at Disneyland® Resort Early registration begins in a few weeks: Tuesday, August 6, 2014 at Noon Eastern Time. Those who complete both the Princess Half Marathon and the Tinker Bell Half Marathon will receive a special pink Coast to Coast medal!